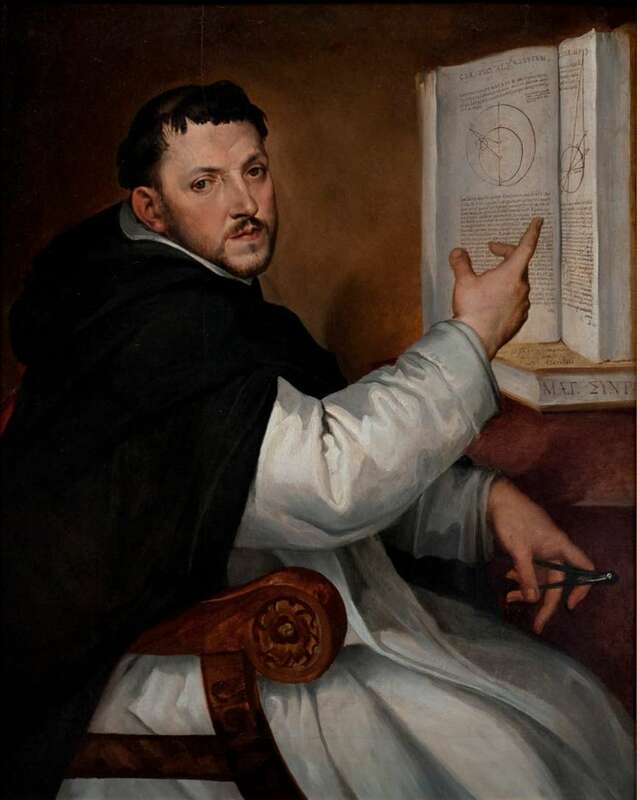 Ignazio (Egnatio or Egnazio) Danti (April 1536 – 19 October 1586), born Pellegrino Rainaldi Danti, was an Italian priest, mathematician, astronomer, and cosmographer. Danti was born in Perugia to a family rich in artists and scientists. As a boy he learned the rudiments of painting and architecture from his father Giulio, an architect and engineer who studied under Antonio da Sangallo, and his aunt Teodora, who was said to have studied under the painter Perugino and also wrote a commentary on Euclid. His older brother Vincenzo Danti would become one of the leading court sculptors of late-sixteenth-century Florence, while his younger brother Girolamo Danti (1547–1580) would become a local Perugian painter of little fame. Danti entered the Dominican Order on 7 March 1555, changing his baptismal name from Pellegrino to Ignazio. After completing his studies in philosophy and theology he gave some time to preaching, but soon devoted himself zealously to mathematics, astronomy, and geography. In 1562, he requested a transfer from the Dominican compound in Perugia to the monastery of San Marco in Florence. Soon after, he found work on the side tutoring the children of wealthy Florentines in mathematics and science. In September 1563, he was invited by Cosimo I, Duke of Tuscany to participate in his great cosmographical project, the Guardaroba in the Palazzo Vecchio. Over the next dozen years, Danti would paint 30 maps of regions of the world (based largely upon published prints by Giacomo Gastaldi, Abraham Ortelius, Gerardus Mercator, and others) upon the cabinet doors of the Guardaroba. He would also work on many other significant scientific and cosmographic projects in Florence, including the large terrestrial globe of the Guardaroba (1564–1568), and a number of brass scientific instruments (such as an astrolabe) today in the Institute and Museum of the History of Science in Florence. Between 1567 and 1569, Pius V, who belonged to the Dominicans, is said to have commissioned Danti to furnish plans for the construction of a Dominican church and convent at Bosco Marengo in Piedmont; Danti acted mainly as an advisor. During his stay in Florence, Danti taught mathematics and published over a dozen scientific treatises, mostly commentaries on ancient and medieval astronomy and mathematics or explanations of how to use scientific instruments. For much of his time in Florence, Danti resided at the convent of Santa Maria Novella, and designed the quadrant (on the right) and the armillary sphere (on the left) that appear on the end blind arches of the lower facade of the church in 1572 and 1574, respectively. He also designed a large-scale gnomon for the church which would allow a thin beam of light to enter the church at noon each day through a hole just beneath the facade's rose window, although it probably was not completed by the time Danti left Florence. There were also discussions between the Duke and Danti about building a canal to place Florence in communication with both the Mediterranean and the Adriatic. However, this grandiose plan never got underway before Cosimo's death in 1574. The following year Cosimo's son, Grand Duke Francesco I de' Medici, forced Danti to leave Florence (in late September 1575) on an uncertain morals charge. It is not known precisely why Francesco exiled Danti, but the Dominican had no trouble finding work or patrons anywhere else in Italy, although he never returned to Florence before his death. After leaving Florence, Danti became professor of mathematics at the University of Bologna. While occupying this chair he built a massive gnomon in the Bolognese church of San Petronio, the meridian line of which is still visible in the church's pavement. He also spent some time in Perugia, at the invitation of the governor, where he prepared maps of the Perugian republic. On account of his mathematical attainments, Pope Gregory XIII invited him to Rome, appointed him pontifical mathematician and made him a member of the commission for the reform of the calendar. He also placed him in charge of the painters whom the Pope had summoned to the Vatican to continue the decoration of the palace, most notably to make a number of maps of the regions of modern Italy in the newly constructed Gallery of Maps along the Cortile del Belvedere. This remarkable project, begun in early 1580 and completed about 18 months later, maps the entirety of the Italian peninsula in 40 large-scale frescoes, each depicting a region as well as a perspective view of its most prominent city. When the pontiff commissioned the architect Domenico Fontana to repair the Claudian harbour it was Danti who furnished the necessary plans. While at Rome Danti published a translation of a portion of Euclid with annotations and wrote a life of the architect Jacopo Barozzi da Vignola, preparing also notes for the latter's work on perspective. In recognition of his labours Gregory, in 1583, made him Bishop of Alatri in the Campagna. Danti showed himself a zealous pastor in his new office. As bishop of Alatri, Danti convoked a diocesan synod, corrected many abuses, and showed great solicitude for the poor. Shortly before his death Pope Sixtus V summoned him to Rome to assist in the erection of the grand obelisk in the piazza of the Vatican. 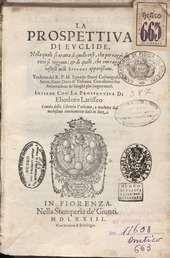 Besides the works already mentioned, Danti was the author of Trattato del'uso e della fabbrica dell'astrolabo con la giunta del planifero del Raja; Le Scienze matematiche ridotte in tavole, also a revised and annotated edition of La Sfera di Messer G. Sacrobosco tradotta da Pier Vincenzio Danti. The first mentioned work deals with the use and construction of the astrolabe and is one of the oldest instructions for scientific instruments. Danti provided with his book the first Italian treatise on this topic. He died at Alatri, only three years into his service. 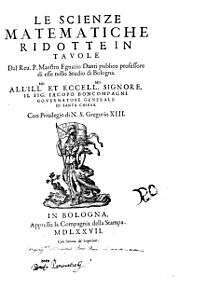 After Danti's death, in 1588 Giovanni Antonio Magini was chosen over Galileo to occupy the chair of mathematics at the University of Bologna. ↑ Ralf Kern, Wissenschaftliche Instrumente in ihrer Zeit, Vol. 1, Cologne: Koenig, 2010, p. 318. Egnatio Danti, Les deux règles de la perspective pratique de Vignole, 1583, Pascal Dubourg Glatigny, Paris, 2003, ISBN 2-271-06105-9. O'Connor, John J.; Robertson, Edmund F., "Ignazio Danti", MacTutor History of Mathematics archive, University of St Andrews . Online Galleries, History of Science Collections, University of Oklahoma Libraries High resolution images of works by and/or portraits of Ignazio Danti in .jpg and .tiff format.